One of the defining and essential features of life is genetic material. An organism’s genome is the complete set of all genes and genetic material that is present in that organism or individual cell. Often we think of genes in terms of protein-coding genes, or genes that are transcribed into mRNAs and then translated into protein; however, genomes consist of a lot more than just protein coding genes. In addition, the features of prokaryotic and eukaryotic genomes differ in terms of both size and content. The image below shows the different ranges of genome sizes in different taxonomic groups of life. Note that, in general, prokaryotic genomes are smaller than eukaryotic genomes. However, eukaryotic genome sizes are vary wildly and are not linked to organimsal “complexity.” Refer to this diagram as you read on about the differences and similarities between prokayotic and eukaryotic genomes. The genomes of Bacteria and Archaea are compact; essentially all of their DNA is “functional” (contains genes or gene regulatory elements). Genes in a biochemical pathway or signaling pathway are often clustered together and arranged into operons, where they are transcribed as a single mRNA that is translated to make all the proteins in the operon. The size of prokaryotic genomes is directly related to their metabolic capabilities – the more genes, the more proteins and enzymes they make. The genome sizes of eukaryotes are tremendously variable, even within a taxonomic group (so-called C-value paradox). Eukaryotic genomes are divided into multiple linear chromosomes; each chromosome contains a single linear duplex DNA molecule. Eukaryotic genes in a biochemical or signaling pathway are not organized into operons; one mRNA makes one protein. Many eukaryotic genes (most human genes) are split; non-coding introns must be removed and the exons spliced together to make a mature mRNA. Introns are “intervening” sequences in genes that do not code for proteins. 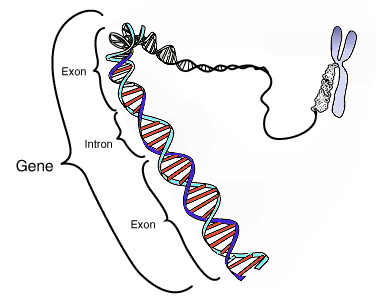 The image below shows a zoomed-in region of a gene highlighting the alternating exons and introns. The multiple exons in a eukaryotic gene can be spliced in different ways to make multiple mRNAs and multiple proteins from a single gene (alternative splicing). The majority of human genes can be spliced in two or more different ways. Therefore, the actual number of human proteins far exceeds the number of protein-coding genes. Alternative splicing often results in “tissue-specific” versions of the same gene, where one splice variant is present in, for example, cardiac muscle, while a different splice variant of the same gene is present in skeletal muscle. The image below shows one hypothetical gene with 3 different possible proteins depending on which exons are included in the final mRNA. One gene is transcribed, then spliced in different ways to produce mRNAs that encode related proteins with different exon combinations. What accounts for the variation in genome size? There is no good correlation between the body size or complexity of an organism and the size of its genome. Eukaryotic genomes sequenced thus far have between ~6,000 and ~30,000 protein-coding genes, or less than 10-fold variation in the number of genes. The human genome has about 21,000 protein-coding genes (recently revised to as few as ~19,000 genes). Therefore, the 10,000-fold variation in eukaryotic genome size is due mostly to varying amounts of non-coding DNA. It’s very interesting to note that humans have about the same number of genes as the microscopic nematode worm, C. elegans, and fewer genes than rice. What’s in the human genome? Protein-coding (exon) DNA sequences comprise less than 2% of the human genome. Introns make up just over 1/4 of the human genome. Transposable elements and DNA derived from them make up about 1/2 of the human genome. Transposable elements are essentially “parasitic” DNA that resides in a host genome, taking up space in the genome but not contributing useful or functional sequences to the genome. They are the DNA transposons, LTR retrotransposons, LINEs and SINEs. Because they are parasitic DNA elements, transposable elements are extremely valuable for studying evolutionary relationships. If a transposable element “invades” an organism’s genome, then it is likely to remain in that genome as the population evolves and when speciation occurs. If the same transposable element is present in the same location in the genomes of two different species, this is strong evidence that those two species share a recent common ancestor who also had the transposable element in its genome. One family of SINEs, called the Alu element, is a 300-nucleotide sequence that is present in over 1 million copies in human and chimpanzee genomes. Segmental duplications are relatively long (> 1 kb; kb = 1,000 bp) segments of DNA that have become duplicated. These duplications create copies of genes that can mutate and acquire new functions. Gene families (e.g., alpha- and beta-hemoglobin, myoglobin) arose this way. Is the human genome 80% “junk” or 80% functional? Recent publication of data and papers from the ENCODE project, a systematic survey of the human genome variation and activity from chromatin modifications to transcription, has claimed that, contrary to previous belief, fully 80% of the human genome has at least some biochemical activity, such as transcription (The ENCODE Project Consortium, 2012). Indeed, many small RNAs, called microRNAs (miRNAs) with important regulatory roles are transcribed from intergenic regions. However, these miRNAs and other regulatory RNAs comprise less than 1% of the human genome, and other studies have indicated that only 10% of the genome appears to be subject to some evolutionary constraint (review by Palazzo and Gregory, 2014). The human genome project was accomplished by large banks of automated sequencers that used the Sanger dideoxy sequencing technology. In recent years, however, massively parallel sequencing technologies have brought down the cost and throughput of DNA sequencing much faster than computing speed and power has increased (Moore’s Law). Written by: Jung Choi on October 13, 2014. Last revised by: shanakerrMay 8, 2018. Polycistronic transcripts in eukaryotes are exceptional – “numerous” is misleading. For the purpose of an intro biology course, as a general rule eukaryotes do not have polycistronic transcripts. Eukaryotes have tremendous diversity, and some eukaryotic organisms do have a few polycistronic transcripts, which are still exceptional even for those organisms.